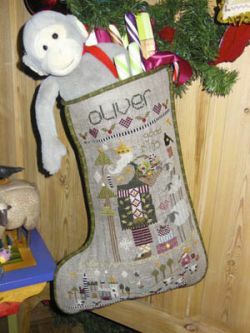 Oliver's Stocking from Shepherd's Bush is stitched on 18 count Natural Linen with a stitch count of 117w x 165h using#5 Perle Cotton, DMC, DMC Color Variations and Weeks Dye Works. An embellishment pack is available. Sadie's Stocking from Shepherd's Bush is stitched on 18 count Natural Linen with a stitch count of 124w x 180h using #5 Pearl Cotton, # 5 Weeks Dye Works Pearl Cotoon, #5 Crescent Colour Pearl Cotton. A charm pack is available.